Microweber CMS and Website Builder is currently looking for an investor to bring internet user experience to the next level. Our team believes in good partnerships, bright feature and market potential. Microweber is a multi-featured open-source content management system (CMS) and website builder, changing the way people publish on the internet and create websites. The project has ranked as one of Bulgaria's Top 10 startups. Microweber is also in the top 100 startup organizations in Europe for 2015/2017/2018, according to the WEBIT festival foundation. The Web Content Management market is estimated to reach $10.63 billion in 2022 compared to $4.91 billion in 2017, according to a recent survey carried out by Markets and Markets, a US-based research company. This means an impressive Compound Annual Growth Rate(CAGR) of 16.7%. 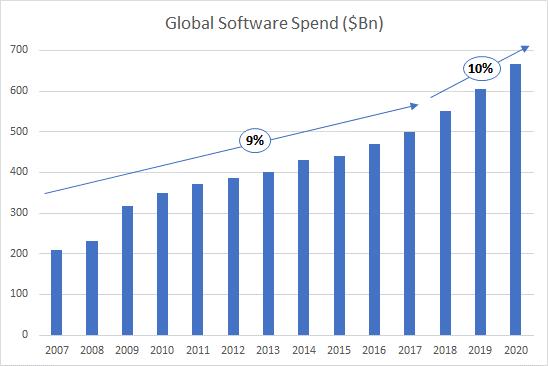 Enterprise software continues to exhibit strong growth as well, with worldwide software spending projected to grow 9.5 % in 2018, increasing another 8.4% in 2019 to total $421 billion, according to Gartner, a leading research and advisory group. FREE vs PAYING CUSTOMERS - FREE attracts huge client base, which, once convinced of a brand's reliability, tend to convert into PAYING CUSTOMERS for web development, hosting, domains, support, templates, paid plug-ins, enhancements, etc. OPEN SOURCE means trust and reliability – open-source software has been growing in popularity over its higher efficiency, security and stability. Nowadays, a whopping 98% of enterprise-level companies use open source software offerings in some capacity. This means a huge need of hosting, templates and modules, support, customization, tailor-made software solutions and design, etc., which are all paid services that we offer. ESTABLISHED – Microweber has a solid base of 40,000+ active users, with their number growing steadily since its creation, as more and more users migrate to our system from our main competitors – Wordpress (30% global market share), Joomla (3.1%), OpenCart (2.5%) and Drupal (2.2%). Investing in a software product which already has a solid base and foundation is a very safe step – you can count on a good ROI in relatively short timeframes. ONE-OF-A-KIND –The unique thing about Microweber is its "live edit" mode, which allows users to edit their websites directly as they see it, utilizing a Drag & Drop functionality and a WYSIWYG (what you see is what you get) editor. While there are other CMSs and website builders, offering this functionality, none of them have integrated it so successfully in their interface and none of them can compete with the ease-of-use and smooth user experience offered by Microweber. Microweber's other distinct advantage is that it successfully combines e-commerce system, content management system and blogging platform. BROAD TARGET CUSTOMER RANGE – Microweber is aimed at a broad range of communities – starting from end-users, freelancers, software development and web design companies, and reaching hosting companies and SMEs (small and medium-sized enterprises) in general. DEBT-FREE – Microweber is a debt-free company, so any future investor will not be burdened by any liabilities, with all the capital flowing directly into profit-generating activities. SAFE EU INVESTMENT DESTINATION – Microweber is based in Sofia, Bulgaria – a country that has been an EU member since 2007. EU membership guarantees safeguarded investments and streamlined procedures for doing business. Bulgaria is known as an IT leader on the continent, attracting sustainable businesses in the industry. The reasons behind that have to do with the big amount of highly educated developers and IT experts, relatively low salaries and a flat income tax of just 10%. STRONG AND STABLE DEMAND – spending on software has grown at a 9% rate for about a decade and is expected to expand by 8-11% versus the US economy at 2-3% and broader technology spending at 3-4%. 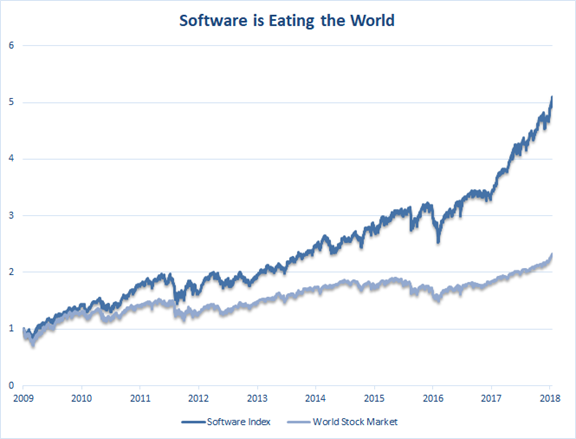 For the past 15 years, software companies have created a lot more value than other businesses traded on stock exchanges. And they know what they are doing – investing in software is a safe bet. Good RoI in relatively short time frames. 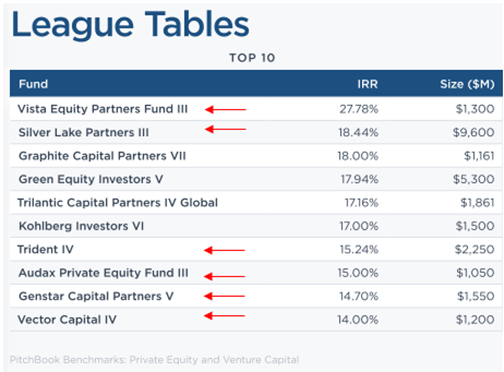 Note: Companies that invest mainly in software are marked with a red arrow. IRR stands for Internal Rate of Return. Software is one of the most profitable industries in the world. 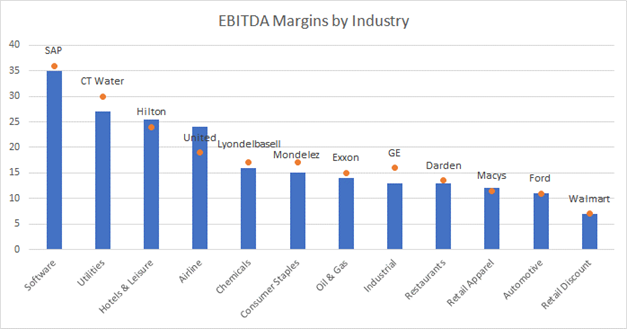 Just take a look at the average EBITDA margins by industry + example. The market is exceptionally well developed. Last but not least, investing in a software product is much safer and more secure than investing in bitcoin at this stage. For further information and inquiries, please fill in the form below and we will get in touch with you within two business days.